In Indian Society, it has been noticed by everyone that equality plays a vital role in various stages. For eg Equality between two religious groups, communities, etc as a lot of diversity has been handled by Indians. If we have differences we all have to work out to meet both ends that is to provide facilities and duties equally to both ends. To manage a balance, you need to put equal pressure on each basket or side. Similarly, let us name each end. Now you can clearly see each side has same amount of pressure. To come directly to my point, why duties or responsibilities are divided between both genders. Answer is to balance. It is easy to say that “I am independent and I can do whatever I want to do”. If everyone will enjoy the independence then who will be taking care of responsibility. As I have heard by many men that they support their wives. Is it correct to say that the wives should be grateful to them. No, they should not be as it is not that men are supportive rather it is their duty. Next point to females who are working or non working. Why are you working, just to prove your ability? Think over it, as my points are different or rare or may be radical for few. The figure I would like to show : What a new age woman wants. Let's calculate the stress level of each side. These are the points which both genders are handling in their daily routine. Women who want their financial independence or want their husband, brother, father or any male member to participate equally in handling the household chores, should share the load which lay under the category of males. They should also cater for paying certain bills of fees or medical expenses or any other such expenses to feel the same independence that every male is enjoying. After reading this brief article about gender equality do you still think females are not enjoying equality on basis of independency? Deepika Badlani is a free hand and calligraphy artist and handwriting expert. She is qualified in commercial art from Meera Bai Ploytechnic, New Delhi. She has been taking on professional assignments related to virtually every sphere of commercial art and advertisement for the last 10 years. Her passions also include reading and music. She has a good knowledge of Child Psychology and is a teacher of graphology and handwriting analysis. Deepika Badlani writes on lifestyle, art and parenting. 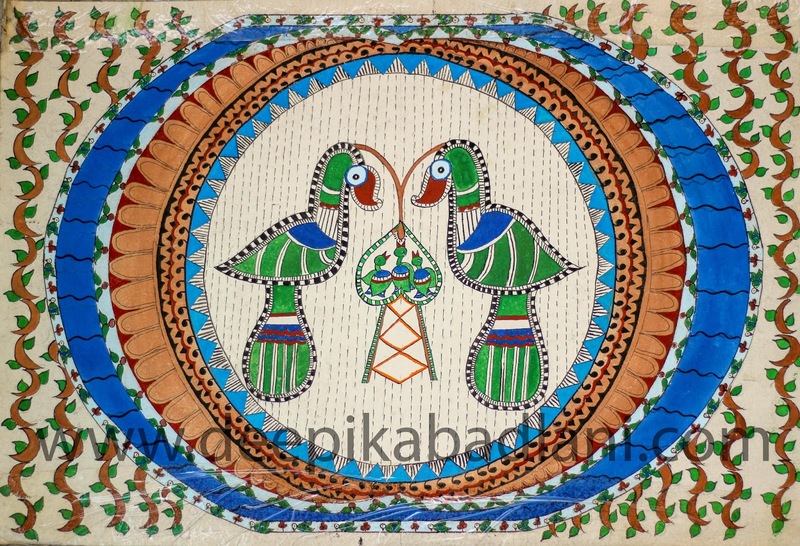 This article features a Madhubani Painting hand drawn by Deepika Badlani. 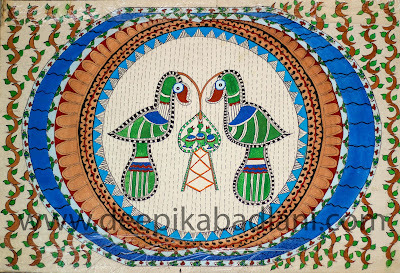 Madhubani paintings derive their name for a region in Bihar, from where this style of painting originated. Earlier the paintings were exclusively drawn only on wall and floors of houses. Modern times, these paintings have a universal appeal. A Madhubani painting depicts Gods and Goddesses or captures everyday objects and situations. In old days there was no technology to capture an event except to paint it. Artists were commissioned for special occasions to capture the moment. Madhubani paintings are characterized by intricate and repeat patters often featuring objects from nature. To depict equality in a relationship, Deepika Badlani has depicted parrot parents who are taking equal responsibility for feeding their children.